Every March 25, just after the vernal equinox and exactly nine months before Christmas, thousands of pilgrims come to Nazareth to remember the “Annunciation,” the time Christians believe the angel Gabriel revealed to Mary she would conceive the Son of God. Roman Catholics head for the Basilica of the Annunciation, the largest church in the Middle East. Greek Orthodox visitors go instead to the smaller Church of St. Gabriel. Each church claims to lie over the exact spot where Gabriel encountered Mary. Based on a writing unknown to most Christians, both churches may be right. The Greek Orthodox Church of St. Gabriel lies over an ancient spring, visible below the church, which first became a church site early in the fourth century. The original church was built by Roman Emperor Constantine, apparently at the urging of one Count Joseph, who claimed Gabriel had spoken to Mary at the spring. 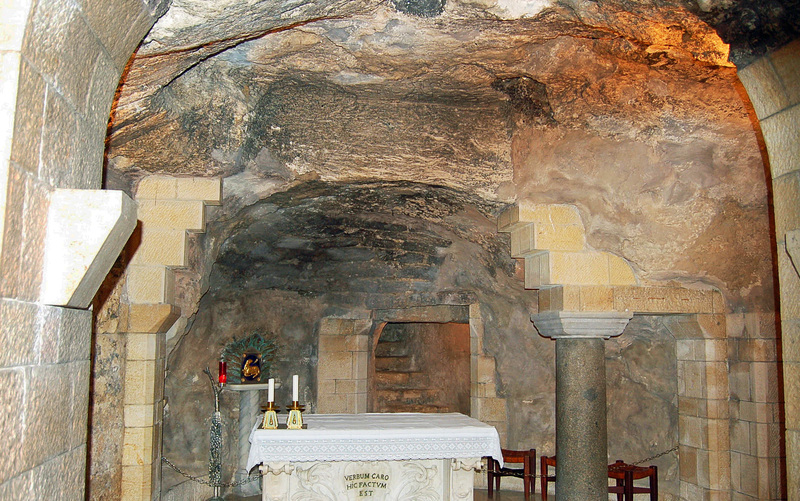 Less than half a mile away, the Franciscan Basilica of the Annunciation lies above a cave claimed to have been the childhood home of Mary when Gabriel came calling. The first church on this site was built sometime after 383, when a Spanish nun named Lady Egeria visited Nazareth and returned saying that she had found the cave in which Mary lived. 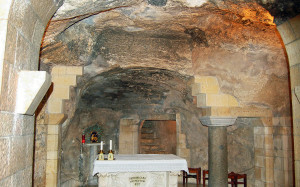 Today that cave is a grotto under the church, with stairs leading to a room claimed to be Mary’s kitchen and a column marking the traditional spot where Gabriel stood while making his momentous announcement. The Gospel of Luke, the only Biblical account of the Annunciation, says only that Gabriel came to Mary at “Nazareth, a town in Galilee.” The Infancy Gospel of James, a popular second century text elaborating on the Biblical narratives about Mary, reports that Gabriel first approached Mary as she was fetching water for her jar and then completed his revelation in Mary’s home, to which she had retreated, trembling with fear. Next year, maybe visitors to Nazareth will refer to their copies of the Infancy Gospel of James, now available online, and conclude they could appropriately celebrate the Annunciation in both churches. One can hope.